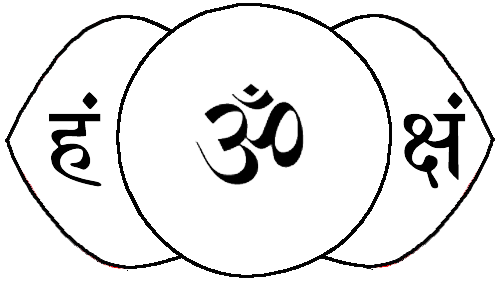 Creation occurred due to the first sound Aum. The universe and everything in it is condensed energy, that energy is vibrating and all has sound. The body itself is sound, called sabda in Sanskrit. The body can be recreated with sound as many modern technologies are now tapping into. In the ancient Puranas (sacred story texts), there are elaborate stories of the creation of the world (shristi karana). Meditating on the seed sounds (bijas) of the chakra petals is also called shristi karana, for it is the recreation of the body through sound (sabda). This is the practice of meditating on the chakras according to the Achyutananda tradition. (1) First step is to worship the Guru and Paramguru. Those who don’t have one can do the mantra “Aum Vyam Vyasadevaya Namah”  108 times while meditating on the crown, imagining golden radiant light coming into the crown and light sitting on the head. The Guru’s grace rests on the head. (2) Next pranayama can be done. (3) Meditate on the third eye chakra, bringing the awareness there. (4) If one knows the Agni navakṣari mantra it can be done 21 times (5) followed by the Chaitanya mantra, or just praises to the fire of the third eye fire. (6) Then one can do their parampara mantra  to stabilize the five aspects of the mind and make it peaceful. (7) When the mind has become stable and peaceful one begins with the throat chakra. 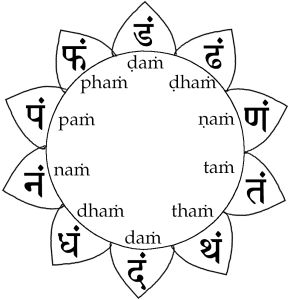 It contains 16 petals, each with the vowels of the Sanskrit alphabet. A knowledge of Sanskrit alphabet and its pronunciation is very helpful. Some traditions use “Auṁ (the akṣara + ṁ) namaḥ”. So it would go “Auṁ aṁ namaḥ”, “Auṁ āṁ namaḥ”, etc. 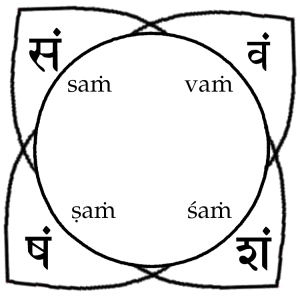 (8) Next the petals of the heart chakra are visualized with the first twelve consonants of the Sanskrit alphabet. 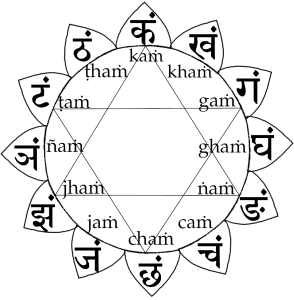 (9) Then the petals of the navel chakra are visualized with the next 10 letters. (10) The Svadhisthana (2nd chakra) has 6 petals. (11) The root chakra has four petals and is often visualized as parallel to the ground. Next the Kundalini is raised from the root to the top to create the two petals of the third eye. Sri Achyutananda Das teaches that each chakra has a different shakti, and we go through and pray to each. In South India there is Tirupati, the place of the 7 hills, which are considered a pilgrimage place. These 7 hills reside within the body, and all the gods reside within the body. The root chakra is the abode of Ganesh with his wives Vriddhi and Siddhi. He (the son) is always worshipped before seeking the Mother (Kundalini), he is the gaurdian of the doorway and prepares the Kundalini for rising. (13) The ‘mountain’ is climbed by cleaning the bhutas (elements). The earth seed sound (prithvi bija) is used at this point. ‘LaM’ purifies the earth element and gets us ready to move to the 2nd chakra. Purification of the element (Bhuta shuddhi) is recommended to do between chakras in this tradition, not in the chakra itself. Earth rules the space between the root and 2nd chakra, water rules the space between the 2nd and third chakra, etc. (14) In the second chakra The god of love and his wife passion (Kamadev and Rati) are worshipped, (15) then ‘vaM’ bija is done ascending to the next chakra. (16) Brahma and Saraswati are worshipped in the navel center (nabhi chakra), (17) then ‘raM’ bija is used for purification of the fire element (agni bhuta shuddhi). The tradition teaches that your chosen form of God (Ishta devata) dwells in the heart lotus. It is the personal form of the liberating deity. In Odisha, this is often one of the avatars of Visnu, (according to the 12th house from Karakamsa). (18) One is to dwell in the heart lotus, where one can realize themselves. 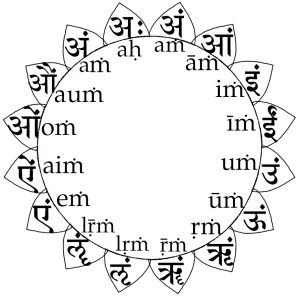 (19) Mantra of the Ishta devata is to be done in Gyatri, or a mala mantra, but nothing shorter than a dwadaksari mantra . The bija of the Ishta can be established in the heart, in this way it will always protect the practitioner. Then take permission to visit the Guru, “send me to the Guru so that I may have your direction (gati)”. (20) Then rise to the throat chakra with ‘yaM’ bija purifying the air element. The 5th chakra is the residence of Shiva and Parvati. Gati, direction, is in the feet of Shiva and Parvati. It is the Mother that gives gati- our direction in life. (21) Do the correct mantras to them and you will speak the truth. Patanjali says those who always speak the truth, everything they say comes true. (22) Rise to the ajna chakra with the akash bija ‘haM’. (23) Worship or meditate upon Agni, the god of fire (one can use raM bija if they don’t know anything else). This purifies your negative attitudes and tendencies and prepares you to be with the Ishta Devata. (23) Meditate with the third eye petals ‘haM’ and ‘ksaM’. (24) Rise up to the crown to visit the paramguru/Sadashiva. The body should become cool and calm. Depending on one’s parampara (tradition of yoga), reside in at the crown or return to the heart lotus and reside with the Ishta Devata. The Ishta is now beyond form, nirankara. Form was created by Maya (illusion), but is removed after the blessing of the Guru. Vyasadeva (also called Vedavyasa) is the compiler of the Vedas. He is an archetypal paramguru who represents the compiling, harnessing, and application of knowledge. Invoking him is invoking guru’s grace, which is the asking for yourself to be in harmony with the universe so you can open to universal truth. One can also invoke their personal paramguru of their lineage, or use a traditional Shiva mantra. Parampara mantra is the traditional mantra that is used in one’s lineage. One can also use a diksa (initiation) mantra if they don’t have a lineage. Or one can use traditional mantras like ‘Aum Namah Sivaya’ or ‘Hare Rama Krsna’ etc. 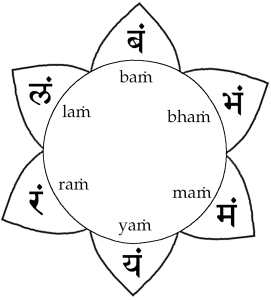 Dwadakshari mantras are mantras that have 12 syllables. Ishta mantras often have 12 syllables, as Rshi Parashara said in the Visnu Purana that those who do the 12 syllable mantra of Vasudev never return (and he was the most famous astrologer, one who would have such knowledge). The Ishta is also seen in the 12th house from karakamsa so it is activated by 12 syllable mantras. The Ishta Devata is revealed to one after much tapas has been done and is the guiding light, protecting deity, liberating energy of the soul. Freedom lives half the year in India and abroad, the other half in the USA teaching classes and workshops on Yoga and Jyotisha. He is also available for private instruction in Yoga, meditation, Ayurvedic diet and herbal consultations, and Vedic Astrology Readings.